Here is my selection of the best upright exercise bike models for 2019! Keep your body in shape. Have the most comfortable morning or afternoon exercise routine with Body Rider Fan Bike BRF700. This delightful exercise machine would help you tone up your lower body by cycling the pedal and firm up your upper body by moving the arm handles. To make you feel cozy while doing your 20-30 minutes work-out session, this product features a fan wheel that provides a mild breeze as you cycle back and forth. Body Rider Fan Bike has also an edge when it comes to electronics – it has a digital display that would allow you to see the time elapsed since you started on wheels, your speed, distance covered and of course, the total calories that you were able to burn during the entire course of the exercise. It also allows you to adjust the tension depending on your preference by simply turning the knob designated for tension value. Lastly, this product comes in an adjustable seat that caters a relaxing sitting position for people of all stature. 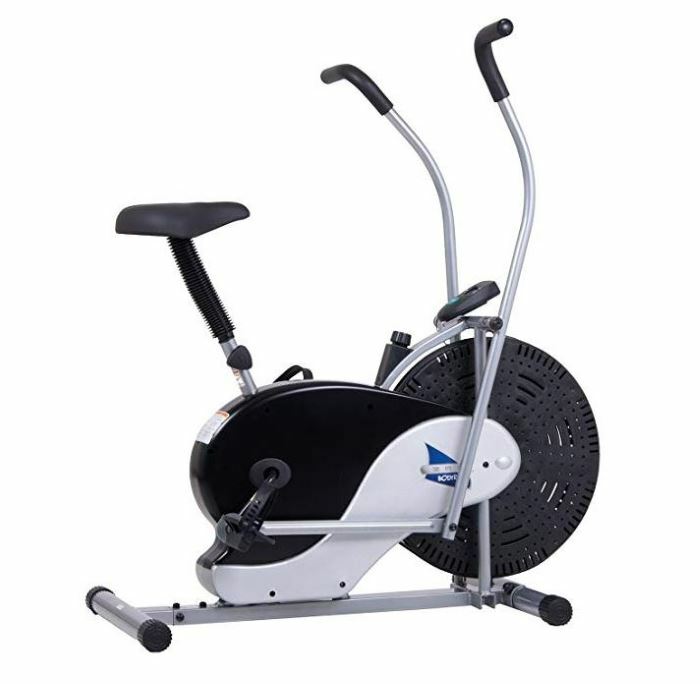 Body Rider Fan Bike is a great deal if you wanted to have a quality exercise session even if your budget is tight. This product comes in an affordable price, but still assures you a comfortable and superior work-out period. It is also easy to assemble for it comes with a manual that would spare you the hassle and complication of putting the bike together. To add up the many asset already mentioned about this wonderful product is that it comes in a sturdy and stylish frame design that would suit any architectural style of your house and guarantees you not to fall off while exercising. If you are living in a small condominium or apartment, you don’t have to worry for Body Rider Fan Bike doesn’t consume too much space. This product is also easy to move around so you can place it anywhere in your house may it be on the front porch, backyard or in your living room. Now, you can enjoy doing your work-out session even while watching your favorite television show. Isn’t that wonderful? Don’t miss your chance of having an affordable, comfortable, fashionable and durable exercise machine that would not only make you look good but also make you feel good. CLICK HERE to buy it! Body Rider BRF700 may seem to be lost in the huge competition of exercise bikes, but its unique appearance and impressive combination of features has given it its own right to stand apart from the crowd. Specific leg exercises, as well as other parts of the limbs, can be effectively performed using this machine, and it bestows a fit form of training which is not possible without it. The most common complaint found against the Body Rider BRF700 is its seat, which is considered to be too hard to be called comfortable. The seat, though adjustable to variable heights, makes the overall user experience difficult, and keeps the bike from being a fully satisfactory product. Nonetheless, for patients with chronic diseases or aching joints, the Body Rider BRF700 is an excellent aid in therapy sessions, made better by the fact that it can be used from the comfort of one’s own home. Through the years, different manufacturers devise ways and come up with new product models that would make exercising more comfortable and convenient. Diamondback Fitness 500Ub Upright Exercise Bike is a great exercise machine that would provide you an efficient morning work-out session in the most comfortable way possible. 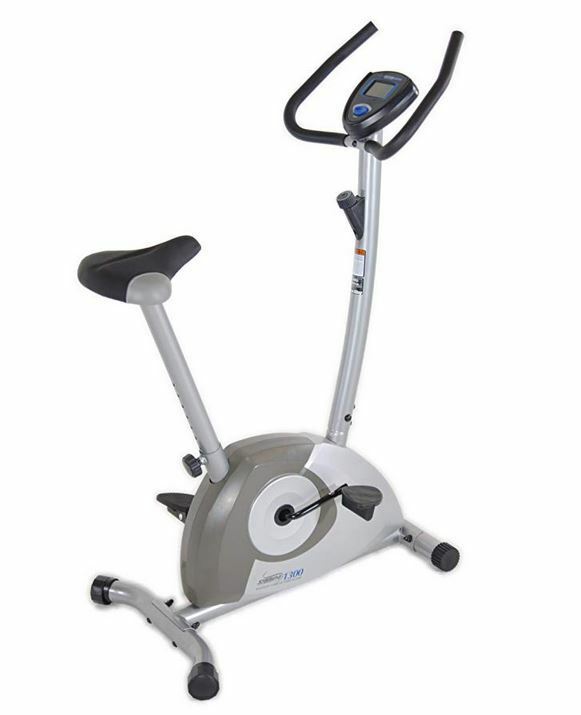 Diamondback 500Ub is an upright exercise bike featuring an eddy current break resistance. It has 16 levels of resistance you could choose from that would suit your needs. You could start off from the lowest level of resistance and increase it to come up with an all-out cardiovascular and body work-out. It also offers various programs types including Manual, Random, Glute Max Hill Climb, Fat Burning Intervals, Target Heart Rate and Custom Trainer where you can have different exercise types every day. Diamondback 500Ub upright bike is specially designed to give maximum comfort to users while exercising at the comfort of their house. It has an adjustable seat that’s ergonomically designed to separate weight equally and has flexible panel that cuts down the pressure and gets rid of the numbness that is quite common with other exercise bike models. Diamondback 500Ub bike also has self-leveling pedal with adjustable straps that makes sure you get an efficient work-out without compromising your knees and ankles. With this features, you can assure to experience nothing but comfort while keeping your body healthy and in shape. Diamondback 500Ub is engineered with built-in consoles allowing you to keep track of the Distance, Time, Pulse and Calories you have burned down during the course of your work-out and blue back-lit LCD screen that displays these readouts. It also has pulse sensors on the handgrips enabling you to monitor your heart rate and cardiovascular performance. To make your morning work-out more fun and exciting, Diamondback 500Ub is equipped with built-in speakers and plug-in jack for MP3 player providing you background music while cycling on your bike that makes you feel like having a morning jogging routine on the street where in fact, you are just within the borders of your house. It also has accessory holder on the console intended for books and magazines and a built-in Smart Fan giving you a gentle cool breeze while exercising. Diamondback 500Ub measures 39 x 60 x 20 inches, perfect for small houses and apartments and has a 275-pounds user weight capacity. It has limited lifetime on the frame and brake, three years on parts and electronics, and one year on labor. 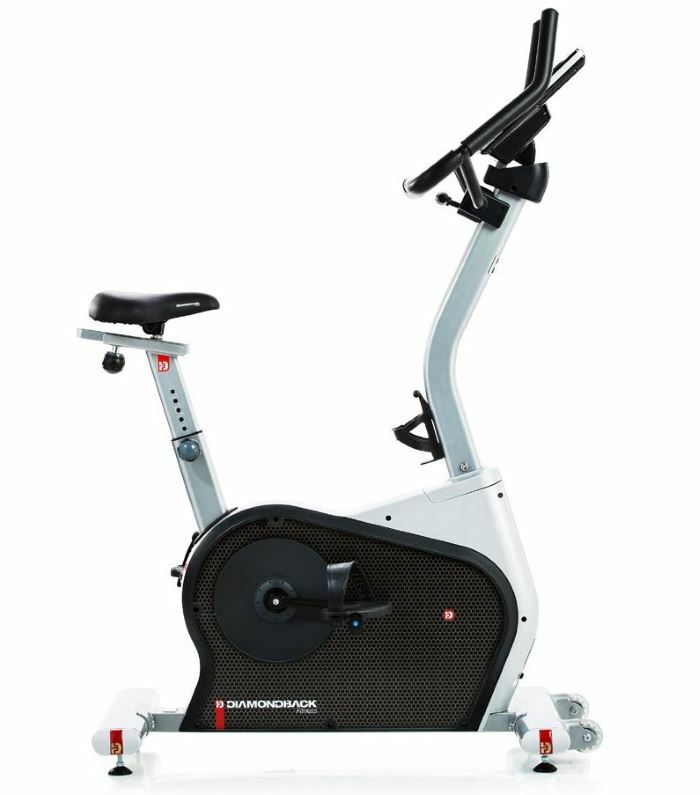 Diamondback Fitness 500Ub bike is not just home fitness machine of form and fashion, but also of functionality and flexibility. Diamondback Fitness 500Ub is an example of ‘what it says on the tin’, as it is made to provide fitness above all else. For heavy duty performance and weighted training, this upright exercise bike is an amazing tool. The built-in trainer programs guide the user through a number of exercises, while the speaker can be used to keep up a musical environment.Such common, yet helpful features make the training itself an enjoyable process. The flaw appears in the fact that this exercise bike does not seem to have a long lifespan, despite possessing amazing durability. If you are thinking of purchasing home gym equipments that will allow you to exercise without the need to leave the comfort of your own place, one product that I can recommend is the Diamondback Fitness 510Ub Upright Exercise Bike. This is especially designed by professionals in order to deliver results that can lead into a fitter and healthier body. In the different opinions that have been expressed by the users of this exercise bike, one that I find to be most noticeable is that it offers excellence when it comes to flexibility. I am sure that you will agree with me when I say that the home gym equipment should allow you to do different things, depending on the goal that you have in mind. The Diamondback Fitness 510Ub features model 20 workout programs, and this will allow you to choose the one that is preferred. In addition, there are also 16 different resistance levels. For instance, it has personal cooling fans with variable speed, which will provide you with the air that is needed as you exercise. There is also an integrated media center that will allow you to plug your music player so that you can have some tunes to provide you with motivation. It also comes with bright LCD display that shows information that will allow you to monitor the progress of your workout, such as the amount of calories burned. In choosing the best upright exercise bike, I suggest that you pay attention with its durability, which is indicative of being able to provide the best value for every dollar spent. This model will prove to be perfect when it comes to long-lasting functionality. One of the reasons for such it has a durable steel frame that supports weight and makes it able to withstand long-term use. The different components are constructed with the needs of its users in mind and with the ability to last long. For sure, it will take a long time before there is a need for you to have it finally replaced with a new one. 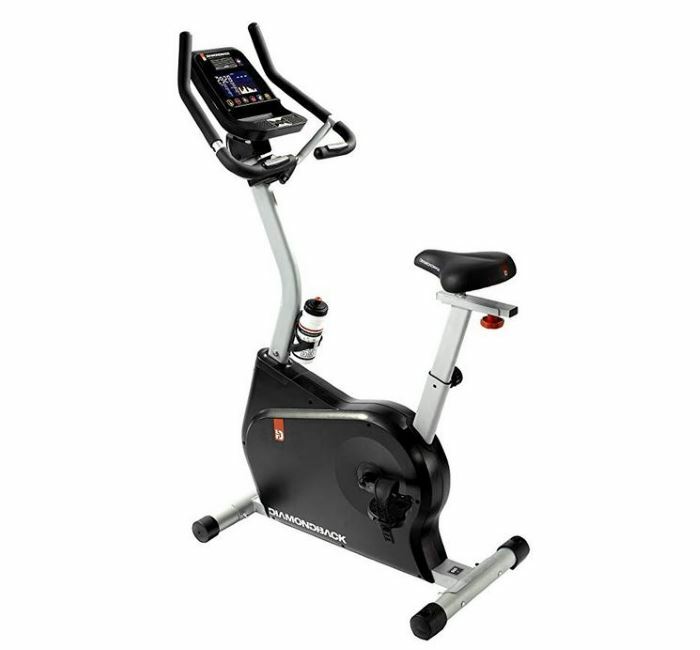 Diamondback Fitness 510UB is an often under looked product in the market of exercise machines and training bikes. But by no means does that indicate that it is not good. In fact, the upgraded version of the 500UB version proves to be just as effective, with a touch of added features that has made dedicated users fall in love with it more than before. If MP3 support and quality speakers do not impress you, then the adjustable backlit LCD display of the heart rate monitor surely will. A wide number of programs have been installed in the machine, and each provides a different but effective training schedule for the best fitness results. The seat, which was disappointing in the earlier version, has been improved to be comfortable. As an upright bike, it beats all others by miles. It makes no noise during its operation, and due to an acceptable size and weight, it is easy to store and to move around. The flywheel and the frame are sturdy and the handle has a strong grip. It is difficult to pinpoint an exact flaw in the Diamondback Fitness 510UB since it is seemingly perfect, but longer set-up time might discourage new buyers from considering this product. This model may not be available anymore. Please check out Stamina 7100 Fusion or Stamina 7250 Fusion! People nowadays are more careful about their body and are coming up with ways on how to keep it healthy and in shape. Stamina 1300 Magnetic Resistance Upright Bike would let you enjoy a low-impact aerobic exercise at the luxury of your home. There has been a wide array of home fitness equipments available in the market that guarantees whole-body work-out without the hassle of going out of your house. Bikes are one of the most-preferred exercise equipments because it is comfortable, convenient, way cheaper than other products and it does not require large space. Stamina Model 1300 is an upright stationary bike offering an aerobic work-out that boosts up metabolism and burns down calories without the impact on the joint. If you are a person that has previously encountered a joint trauma or you simply don’t want to wear out your joints, this is the ideal product for you. Stamina bike also features a cushioned, oversized seat with vinyl covering that provides different seating positions giving you maximum comfort while cycling. It has oversized and weighted pedals for an efficient work-out session. The Stamina stationery bike is engineered with tension dial that allows you to adjust the intensity and resistance anytime you want during the course of your exercise. It also has an easy-to-read monitor with Speed, Distance, Time and Calories Burned readouts that keeps you determined and motivated every time you work-out. The bike runs smoothly without producing annoying noise. It comes with rolls ideal for moving it around the house, placing it anywhere you want and for a quick and hassle-free storage. You can now enjoy watching TV while exercising in your living room or you could also experience the gentle morning breeze as you work-out in your front porch or backyard. The Exercise Bike does not require external power as it is powered by 2 AA batteries which are already included in the set. Because of that even in case of power outage you can still tone up your body and burn your calories with this wonderful device. It measures 35 x 22.63 x 48.5 inches and has compact and sturdy design perfect for people residing in a small-sized house or apartment. Stamina bike is very easy to assemble and if you find flaws and imperfections in your equipment, it has a one year warranty on the frame and 90 days on the parts. This is a lightweight exercise bike that can provide the user with the right amount of fitness training to get the body back in a tip-top shape. It is perfect for home use, due to its quiet demeanor and the ease with which it can be used. It is not that big, and takes little space, even in a cramped household, giving off an alluring look that could double itself as a showpiece. Initial set up is simple, which is a plus compared to other similar models with more complicated designs. The readings are easy to understand and does not cause confusion when scanning them at a quick glance. However, the readings are also the cons, as they do not contain all the information a dedicated user would need. For example, the heartbeat reading is non-existent, which could cause problems when the runner is facing too much stress. Exercising is an important element in sustaining one’s life. While it is true that a person can live without exercising, that life will be riddled with health issues and medical complications that will make it seem like a nightmare instead. Hence, the need for the perfect exercise machine is always there, since people are constantly looking for the easiest ways to effectively get in shape. Due to the advent of modern technology, even taking care of one’s own body is easy, as it has been shown by the Lifecore Fitness Assault Air Bike Trainer. Lifecore Fitness Assault Air Bike Trainer is definitely one of a kind when it comes to models of exercise machines. Built as a stationary bike aimed at the lower body segments, this machine consists of a number of useful features that makes daily exercise a piece of cake. Its computerized display screen shows the amount of calorie burned, in relation to the time spent and distance covered in the overall session. It also keeps a track of the heartbeat to ensure that the exercise is being put to good use. This advanced monitoring technology comes with programs that not only supports, but encourages steady workout routines for various purposes. However, all this training would be for naught if no comfort was provided. Hence, the Lifecore Fitness Assault Air Bike Trainer has a smooth and sturdy exterior complete with twenty sealed ball bearings which provide no irritation to the body. The trainer makes sure that air resistance is not a problem while being on the device, so it adjusts the level of the resistance to sustainable amounts. This is supported by the giant fan on the device, which is twenty five inches in diameter and helps to control the temperature and air resistance even further. The device is even smart enough to adjust itself depending on the user’s limb movements, which cement it as one of the best cross-fit trainers available in the market. There are many pros of the Lifecore Fitness Assault Air Bike Trainer. The seat upon which the user places themselves can be adjusted in a total of six different ways. This unlocks a whole new range of ways in which the bike can be used, allowing different methods of exercising and keeping the body in top form. This complements the handles which provide steady support during the workout progress and ensures a worthwhile session, which your body greatly benefits from. Another great advantage that this bike has is its range of use, which is for just about any age and any size. Lifecore Fitness Assault Air Bike Trainer is one of those products that customers simply cannot complain about. It is a combination of the wonderful benefits that no one can get enough of, and any negative reviews it gets are due to accidental purchases or strokes of bad luck. While it may be a bit tough to use at the first try, that too can be overcome with enough time and practice. Customers love how the Lifecore Fitness Assault Air Bike Trainer can be used for so many different purposes. Be it an official athletic training session or casual everyday workout, this bike can handle it all. In fact, it is great for even medical purposes and physical therapy. Reviews state it to be a cost efficient device that no one would ever have any regrets buying. It can be used by anyone, and due to its full commercial warranty and overall toughness, it will last for a large amount of time without any drawbacks. Lifecore Fitness Assault Air Bike Trainer is an amazing exercise machine that people of all kinds should consider if they want to get their body in a healthy condition.